# HUGE SPOILER WARNING!!! 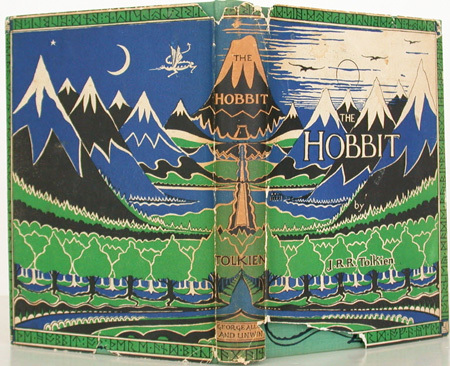 I will discuss much of the plot in both the book ‘The Hobbit’ and associated movies. Azog – You all remember Azog from the movies right, big white dude, missing part of his arm, very central to the entire plot of the movies? Well the thing is that apart from saying he died many years before (killed by Thorin), he wasn’t in the book. Whilst I agree that the constant threat of attack and pursuit from Azog did give a certain urgency to the plot it kind of stuck in my gullet a bit too because this role was really supposed to be for Bolg. Galadriel – Gorgeously played by fellow Aussie Cate Blanchett, she was amazing and I love her in this role and I felt that this character was a good addition to the films, but she wasn’t in the books, at all. This is interesting when she was so integral to parts of the movie’s plot. The character of Saruman was also not in the book, I didn’t really understand the point of him being in the movie apart from at one point being difficult and rude about Radagast and the next minute fighting like the dickens. I also was annoyed because I couldn’t figure out whether they were insinuating that he was already a bad guy when this took place… frustrating. Legolas – Oh I feel bad even writing this part because who doesn’t love Legolas? He is a great character. He is also not in the book, at all. However if memory serves he is identified as the son of Thranduil in The Lord of the Rings so I suppose it is feasible that he was in Mirkwood, but there are whole extra side stories that are added here which were not in the book at all. They are nice and all and as I said before I enjoyed the films, but they are not true to the book. Tauriel – This character does not exist in any Tolkien book I know of. I feel like this character was just added so there could be a love interest for Kili because apparently there has to be some kind of romance thing happening in all movies… sigh. Whilst the actress was good and the character was well written there was no need to add another character and it pissed me off because I felt that this character and the ensuing romance with Kili was the reason that they had to change the ending. Another interesting change was how the group came to be captured by the elves in Mirkwood. In the book the group was drawn to the elves celebrations by laughter and music, in the movie the elves saved them from the spiders and then took them hostage. I guess doing it this way quickened things up, but considering they stretched the book out into three movies you wouldn’t really think there was a need for that. I also felt as though the elves in the films were portrayed very differently from in the book, whilst in the book they were warriors certainly they were also musical and the majority of interactions with them included them singing. This was never shown in the movie, not at Mirkwood or at Rivendell, their entrance to Rivendell was also very different from in the book. I do wonder why the writers wanted the elves to seem so serious, severe, unfriendly and apart from the rest of the world. Interesting. What are ‘were-worms’? I honestly don’t remember Tolkien writing about them, they reminded me of the things from Dune. Am I wrong in not remembering these things from the books? Fili and Kili, I felt like they were robbed of a warriors death and it pissed me off. Poor Fili is basically executed to hurt Thorin and Kili is only killed because he tried to stop Tauriel being killed. Grr. In the book these characters have a fine death, meeting their end protecting their king. I was really frustrated by this. This is hard because like I said in the beginning I liked both the books and the movies, but there was things that the movie changed that as a lover of the book I was disappointed in some parts. I also wanted to see more of the Green Dragon, which I am pretty sure all fans want.